Over the past 32 years, I have represented many people who have been seriously hurt in automobile accidents or accidents at work. They come to me at a time when they are facing many difficult challenges – legally, emotionally and medically. I like being able to help them sort out all of the issues associated with their case and help relieve their stress. I am always amazed by lawyer bashing – nasty lawyer jokes, name calling such as ambulance chaser, and general disrespect or fear of lawyers. Certain folks have a view that some lawyers are greedy. I have found that couldn’t be farther from the truth. I think lawyers are the MOST caring and charitable people I know… always ready to help. And doesn’t that make sense? The majority of attorneys will tell you they became lawyers to help people. Here are a few facts that support my opinion that lawyers are good and giving people. Recently Sojourners’ Place, one of the nonprofit boards I am on, sponsored a dinner and auction. When I reached out to my partners and asked if they would support Sojourners’ Place (whose mission is to assist homeless men and women on their journey to self-sufficiency through case-managed, residential programs), twenty-seven of my partners quickly responded “yes”. Wow! I was grateful, but not surprised. I also called another lawyer friend, Mike Kelly, Esquire, who responded with a very quick “yes!” to volunteer as Auctioneer at the event. Several of my attorney friends either handmade or donated beautiful gifts for the auction. Here at Morris James, many of the attorneys donate their time regularly to non-profit organizations including Girl Scouts, Children’s Beach House, The St. Thomas More Society, Prevent Child Abuse, American Diabetes Association, Habitat for Humanity, Catholic Diocese Foundation, Philippine-American Association, and the Delaware Adolescent Program, Inc., among others. 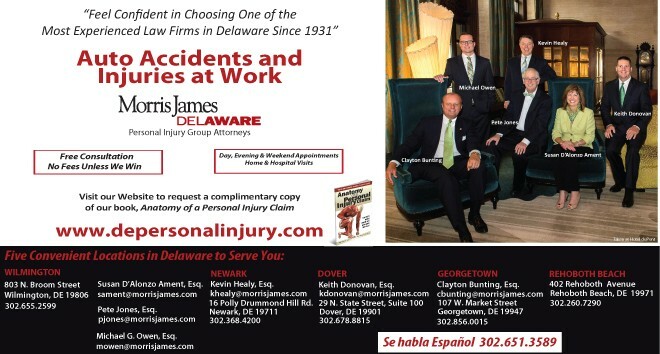 In our Personal Injury Group, Mike Owen is active in the Big Brothers Big Sisters of Delaware program, while Pete Jones and Kevin Healy are two of several Morris James attorneys who volunteer many hours to coach high school students to compete in the Delaware High School Mock Trial program. The goal to serve is not unique to Morris James but is prevalent throughout the entire Delaware Bar. One of the Inns of Court I am involved with is the Pro Bono Inn of Court. Inns of Court are designed to improve the skills, professionalism and ethics of the bench and bar. The Delaware Bar Association assists attorneys and coordinates the pro bono efforts between pro bono agencies. One group I have been privileged to be on the Board of for many years is the St. Thomas More Society. The Saint Thomas More Society is a collection of attorneys of various faiths committed to follow the examples of Saint Thomas More in their professional and personal conduct and to promote and foster high ethical principles in the legal profession and in the general community. Many Delaware Attorneys volunteer to represent children in Family Court through the Office of Child Advocate. Personally, I am honored to have the opportunity to try and make a difference in a child’s life whether in a small or large way. The children represented are going through very difficult challenges, including neglect and abuse. It is rewarding to gain their trust, develop new lifelong friendships, and try to assist the Court in their decision-making process. Attorneys are blessed with special skills and talents and I am always amazed at how generous Delaware attorneys are in sharing their talents. Perhaps they are guided by Isaiah 1:17 – Learn to do good, seek justice, correct oppression; bring justice to the fatherless, plead the widow’s cause. The next time you hear someone speak negatively about a lawyer or tell a bad lawyer joke, I hope you will think of this article and set the person straight. Lawyers are good and caring people whose goals are to help others.